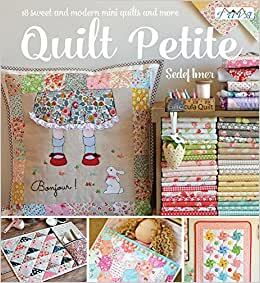 "Quilt Petite" contains 18 sweet small quilts designed by Sedef Imer. Learn how to make mini quilts, cushions, table toppers, doll quilts, place mats, potholders, and lots more. 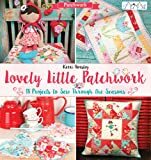 Includes detailed instructions on a wide range of techniques such as patchwork, hand and machine quilting, English paper piecing, foundation paper piecing, raw edge applique, free motion applique, and hand embroidery. Range of projects are suitable for both beginners who wish to learn new techniques and for advanced quilters who wish to practice more challenging ones. sewing, embroidery, and crochet on her website, Down Grapevine Lane (www.downgrapevinelane.com) and is a regular contributor to sewing and quilting magazines worldwide. She lives in sunny South Australia with her husband and their two children. Sedef Imer, where HAVE you been all this time? No spoilers, but the answer is very interesting. Quilt Petite is a divine publication from a Turkish press. In fact, the book itself is diminutive at 8.25"×8.75". Yet it is packed with great photos, illustrations, tips, and Imer's imagination, experience, and personal text. Right away, Imer cautions that this book assumes a working knowledge of quilting. Economically, she refers readers elsewhere for more details about techniques, both basic and advanced. At first glance, Quilt Petite might appear too child-oriented. This could be due to the abundance of 30's repros and tiny florals, or maybe just the fact that the author is a young mother. But a good long look reveals a wider range of projects. There's a dolly sleeping bag at 15.25"×18.5". It was customized for a specific Ikea doll's bed, but is easily adaptable for other sizes. There are several small wall hangings. "Nine Patch" (21.25"×21.25") takes an old standard but downplays the contrast, resulting in a more unusual variation. "Nebula" (16.5"×16.5") is very sophisticated, with 9 levels of shading and curved quilting lines that create a heavenly swirling effect. "Scattered Stars" (17"×17") is a medley of different sizes of paper-pieced stars. It can be as babyish or mature as your heart and stash allow. There's lots more, involving pompoms, lace, ruffles, appliqués, English Paper Pieced hexies, diamonds, and yes, more florals. This is a darling of a book that can be both sweet and sophisticated. What a surprise it is to "hear" from Turkey, via the author and the publishing house TUVA. Welcome to you both, and please ......more! Beautiful book with beautiful projects! I am having a hard time deciding which project to try first! 5.0 out of 5 starsDelightful! Full of happy, fun projects with excellent instructions. Great quilt patterns for small quilts. Anxious together started on some of them. 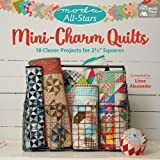 Absolutely the most adorable quilty things to make inside this gem!! Bought this for my Mama for Valentine's Day as she LOVES to quilt and sew. And she finally has 2 granddaughters to make baby and doll quilts for!! Super cute ideas and patterns inside!! Don't hesitate to buy! !